It’s a perfect world and I awake to songbirds, cooing me into consciousness. I eat a surprisingly delicious, kale-filled breakfast and then walk the dog while simultaneously meditating. I settle into a lovely day of writing, phone calls, and catching up with friends. I am wearing a cute outfit, my hair looks amazing, and my home is miraculously spotless. I AM A PARAGON OF POSITIVITY AND PRODUCTIVITY!!! But, sadly, this isn’t a perfect world. On any given day, it’s entirely possible that I will sleep late, work myself into a headache, avoid phone calls, and/or eat popcorn for every meal. Life happens! Deadlines change, priorities shift, and sometimes I just don’t want to put on real pants, okay? So how do we keep our lives from derailing when things get busy? How do we keep making tiny, incremental steps towards the life we want when we’re nearly too frazzled to function? We make and use an Every Damn Day List. An Every Damn Day List is a list of small, suuuuuper doable things we do every blessed day – things that will make our lives just slighty better and easier. These are tiny things we can do regardless of deadlines, laundry piles, or sick partners. The items on our lists are things that give us a tiny boost, a little spark of health or happiness regardless of how the rest of the day goes. They’re small effort, big(ish) impact things that help us feel like Proper Functioning Adults rather than Human Tornados Fueled By Pizza Rolls And Coffee. Bookmark Habits – and to a lesser extent this Every Damn Day List – keep us from throwing in the towel in every blessed area of our lives. They dramatically reduce the number of days that we toss up our hands, declare the entire day a write off, and settle into a funk of bad decisions. If you have an Every Damn Day List, no day will ever be a complete write off. No matter what professional, social, financial, or dietary decisions you make, if you follow your Every Damn Day List, there will be at least a few choices that point you in the right direction. Stayed in your sweats all day, binge watching Queer Eye, and eating pudding cups? At least you walked the dog and made your bed! Flicked someone off in traffic, ignored your mom’s text, and missed the due date on your library book? At least you complimented your barista’s shirt and ate an apple! That’s it! That’s all! None of this is ground-breaking or even particularly hard. If I wanted to, I could bang all this out in an hour. I could eat, think, and do rubbishy nonsense all day but if I spent the hour before bed doing these things, I’d still end the day on a (slightly) up-note. Of course (of course!) everyone’s Every Damn Day List will be different. I need to be reminded to drink water, but maybe you’re an ace hydrator! ‘Reply to 3 emails’ would never, ever need to be on my list, but maybe it should be on yours? These four questions will help you create your own Every Damn Day List. What’s the smallest possible action that will make your space feel nicer? What’s the smallest possible action that will make you feel healthier? What’s the smallest possible action that will make you feel better emotionally? What’s the smallest possible action that will make you feel on top of your life? Next to your desk! The lock screen on your phone! The screensaver on your computer! It doesn’t matter where it goes, it just matters that you’ll see it every damn day. Don’t put more than five or six items on it and make them small! Fellow Type-As, I see you over there, making a 22-point list in which every item takes 2o minutes. Stop. This should be a super short list, populated with hilariously doable things. If any given item takes more than 15 minutes – off the list it goes! If you can’t imagine yourself doing this thing after a long hard day, it shouldn’t be on the list. Why not make sure those tiny daily actions are the right ones? I want to hear from you! Do you have any Every Damn Day List? If you do – what’s on it? Tell us in the comments so we can be inspired by your ideas and try them for ourselves! P.S. Making an Every Damn Day List is a habit you can develop just like any other habit. If you struggle to make habits stick, this will help! All of those fourteen items seem like quite little things, but the list as a whole is daunting. The predictable result is that I do two or three and then “have a bit of a rest.” Meaning, of course, the rest of the day. Girl, dial that ish back! I’m going to add an addendum that an EDL shouldn’t be longer than 5-6 items! thanks Sarah, I’ve been on your email list for quite some time and always enjoy your insight and humor. I do have a list. It’s a fairly recent development and has made a real difference in my unstructured life. In the morning, I do at least 3 of these. Meditation, make the bed, (always, but I still get points), a short burst of isometric exercise, gratitude practice, read an invocation of my superpowers I wrote for myself, do a particular visualization, eat an enlivening breakfast, make a list of one challenging thing to fit into my day .. and .. do it. Yessss! Love it! Those a great Every Damn Day activities! Can I tell you that I love your “invocation of my superpowers”… I’ve never heard that before and so I’m off to Google up some ideas on how to craft my own! I love the “invocation of my superpowers”! I need some superpowers to invoke. Can I start with discerning “URGENT” from “Important” matters and recognizing when I need to say “no” before I’m broke, burnt out, or turning into a cranky old lady? This is great! I recently began the habit of always making my bed in the morning. Not a perfect hospital corners job, but straightened out enough that it looks OK and I can get in at night without much fuss. No matter how much of a disaster my day is, at least I feel like I’m not a complete failure, because at least the bed is made. I am going to expand it into a whole Every Damn Day list. Thanks! I also recently started making my bed! It is so nice to come home to, even if the rest of my house is a disaster. I have a pretty long daily to-do list, which helps me stay on track during my routines. But I think my non-negotiables are to take my meds, make my bed, wear sunscreen, brush my teeth, and eat a fruit/vegetable. Which all sounds like a normal part of being human, but it is amazing how grad school can lower your expectations. ? OMG I could not love this more! It arrived in my Inbox at the perfect time. Oh, I have that list but I didn’t have a name for it. I swear it took me until my 30s to realize how important small doable tasks that move you forward are. It’s like a secret of adulthood that nobody tells you about, and you have to do the hard work and figure it our yourself. 1. Have a smoothie. Takes 3 minutes to make and helps me hit my fruit quota for the day. 2. Air out the bedroom in the morning and right before we go to sleep. 3. Do some yoga. Sometimes, an entire YouTube video. Other times, a 5-minute sequence is all I can handle. And that’s fine. 5. Write down my daily expenses on a whiteboard as soon as I enter the house. It gets transferred to an expense sheet every week or two. Nice! And I LOVE #2, I don’t think I would have thought of that and I’m for sure going to try it! Don’t worry, it took me into my late 40s to discover how to be ‘adultish’! My son reminds me regularly to not be too much of an adult and let go of the unimportant stuff 😉 Great advice from a 20+ year old! I could not love this more! As an artist/Mom my biggest struggle is to get in a little drawing everyday, however small. My Every Damn Day list will include a 15 minute drawing with my morning coffee. Boom. If I can do that I will start my day off on top of the world. Bed-making, water-drinking, and maybe even showering might even make the list…. YES! I don’t call it that, but I do have a list like this! Another salad for breakfast person!!!! I feel vindicated!!!! Bonus: when my brain tells me I’m not disciplined, I remind it that I walk and do my PT every damn day no matter what’s happening or how I feel, which included doing those two things during a bout of pneumonia four years ago (shortened, but still done). I am a Physical Therapist and you made me smile!!! For the past several months I’ve been slowly building/revising lists like this for each of what I call my “critical periods”. My three critical periods are: 1) first thing when I wake up 2) when I get back to my house at the end of the day and 3) before I go to sleep. None of the periods is dependent on happening at a specific hour that way if my day goes off the rails for whatever reason, I have three chances a day to get it back on track. My list for each of the periods includes things that are very similar to the ones mentioned here (e.g., my morning list includes putting on sunscreen, eating breakfast at a table, and drinking a cup of tea). Some of the items on the lists get skipped occasionally, and I don’t worry too much about that, but some are my informal non-negotiables (I’m looking at you, cup of tea in the morning). In the next few months I’m going to make the transition to being self-employed, and I’m foreseeing trouble with that “when I get home” list since getting home will no longer be a reliable trigger when I’m working at home all day. Accepting suggestions for new triggers! And I wonder if there is a task you could put at the end of every day for yourself to mark that transition? I love the different lists to “transition” to different times of the day. I think I’m going to try that myself! I’m thinking right after lunch or dinner might be a trigger time. Currently my home schedule has built in timeframes for lunch and dinner when I’ve had to feed children. I’m finishing 16 years of homeschooling and wondering about a new schedule in the Fall when son move to campus. I feel like I’ll need something to insure I get up before the afternoon when husband gets home! “Fellow Type-As, I see you over there, making a 22-point list in which every item takes 2o minutes. Stop”… Oh… haha you caught me! Making these items “laughably easy” is way more difficult than I expected! I’m with you on that! Slowly putting together my own short list and strangely enjoying the cringe as I cross something off my long list. Bloody brilliant! I have my ‘My Perfect Morning Routine’ posted on my bedroom wall. However, I don’t think feed the cat and have a cup of tea need to be on it lol! In common with most people here….making the bed is on the list – and I’ve got that one nailed! Still, the list needs a bit of tweaking and I love your suggestions! I read about your “old” Every Damn Day List back in, ehm, 2014 (?) and used it as my desktop background for a while. Nowadays my list includes going outside (sometimes when I am sick it’s just for a few breaths while already wearing my PJs, and a good excuse to empty the trash), do a tiny bit of yoga (I call it “Minimalyoga”), floss, and knit. I started with just one and waited for the habit to stick before adding a new one, which proofed to be way more effective than starting (and failing) with a whole bunch right away. I love your list Simone – I also try to get outside, even if it’s just for a few breaths, and do a tiny bit of Yoga every day! I think you’re so right about adding one habit at a time rather than overwhelming yourself with too many at once! Thank you 🙂 No, English is not my native language. But with wearing PJs it could go either way: still wearing them because I never got dressed that day, or already wearing them because it is 10 pm and I almost went to bed without going outside. -Move my body. 5 minutes is great! The best thing I took from military life was how important creating daily habits were. No matter how little you got done, at least your bed was made. I rarely make my bed now but this article reminded me how important this one thing can be. Thanks! Hi, saw the Every Damn Day list through Wit & Delight postings yesterday and thought it was great! My things you can read on my blog, which I posted today. This is such a fabulous idea! Def something I want to incorporate into my planner. Does it have to be the same list or list of different things every day? Load the dishwasher is one! If the world is falling apart, my link’s gonna be clean darn it! Make my bed, put my makeup away, and make sure I have clean clothes for tomorrow. Great idea!! Sure does sound better than re-playing the 10 things I *DIDN’T* get marked off my to do list!! Woohoo! Just found your EDD list! I looove lists! And I’m happy to say that, although, I am kinda’ homeless at the moment (it’s not as bad as it sounds! ), I’ve been doing quite a few of those. Regularly. Which… never happens! It’s a great idea to break them down into the four areas; on days that you are overwhelmed, you could simply chose one from each list. I know I’d feel like I’d accomplished something positive. And I’m so bad at ‘keeping at’ new habits, so I’d better go and check out your ‘good habits’ workshop! Is there such a thing as a page protector for a Classic sized Happy Planner? I would like to put my “every dd list” into one and use a non-permanent marker to check it off. OMG so I’m new to your blog and I LOVE it! I haven’t decided what my every damn day list is yet, but I am pretty sure it’s going to be awesome! All good ideas here but unless I missed it along the way I don’t think anyone mentioned getting a head start every night on tomorrow’s breakfast. I have an early morning smoothie every day. I assemble everything except the frozen ingredients in a personal blender small enough to go in the fridge. The frozen stuff I divvy out in small Ziploc bags when it comes home from the grocery store. Prepping for the start of a good day’s nutrition helps not only my waistline but my head! This is amazing! I never thought of creating a small list this way but will definitely start one. Thanks for sharing! This is awesome!! Something so simple like a small list will help make sure that my day starts right! I love it ? I was just thinking of making this everyday to-do list of important tasks and I accidentally bumped into this article. You have a great point that every person has different daily priorities, but it is important to write it down on paper and obey the list items. And some other, I have to think about it. Others might dedicate 1 hour daily on important tasks, but since I’m full time blogger I can set apart 3 to 4 hours each day for the most important tasks. It may seem like a hassle, but as you’re checking those items on your list you will feel that fulfillment inside of you. Thank you for this great inspirational article and I will keep following your blog in the future. Those are great daily to-dos! Using this for the past 2 yrs has helped me feel better and healthier!! Great post, I featured it in my productivity quick hits! 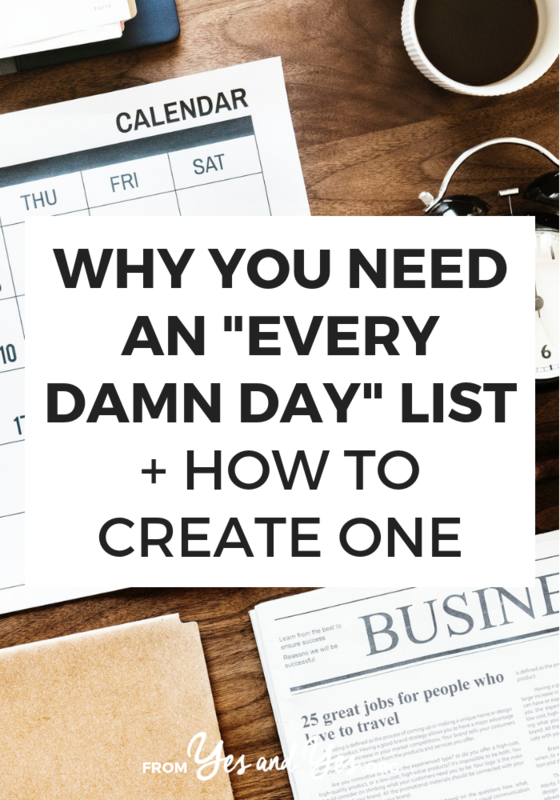 An Every Damn Day list is a great solution for reaching those long term goals!